Please fill out all the fields below completely. Once we have received your application we will review it and contact you. Please allow for 24-48 hours after your application has been submitted. All information is strictly confidential. Please fill in the following information if you currently have a horse. If you do not currently have a horse, please fill in the information regarding the last horse you owned. If you have never owned a horse please skip to the next section. If on pasture, how much land do you have fenced? Does this place have shelter (from wind, rain, snow, sun) in the pasture (tree cover or man-made)? In the event of injury or illness, do you have a place where your horse can be put on stall rest in a confined area away from the other horses? Would you be able to bring a pet to the clinic within 24 hours of a request of a potential owner to meet him/her? Does your vet give vaccines or do you buy them over the counter? Which dewormers do they receive? Do you plan to have others ride this horse? How many horses would you be willing to foster at one time? Are you able to train a horse that you are fostering? If so, what type of training (natural horsemanship, ground work only, ground and under saddle, etc.)? Are you able to haul the horse(s) in order to pick them up or bring them for veterinary care in case of an emergency? Please upload recent photos of your current horses (photos taken within the past month) and photos of the pasture/stable where this horse will be staying to. The current horse photos should show their hooves as well as a side and front view of them. You can also bring cell phone pictures with you when you come if that is easier than sending now. 2) Hoof care: trims are provided every 6 weeks by our farrier. 3) Medical care: Medical care is provided as Dr Jordan deems needed. We will always provide pain control/relief from suffering and we will treat as many injuries or illnesses as we practically can. However, since CARE is not for profit and has limited funds, there are limits to the extent of medical care that can be provided. For instance, CARE does not have the funds to provide for care at a specialty facility. If a horse develops a condition requiring more medical care than CARE can provide, euthanasia may be done to prevent suffering, even if treatment of the condition is possible. If a foster owner wishes to proceed with medical care above and beyond what CARE can provide (for instance surgery at a referral facility), the foster owner should express that desire to Dr Jordan and a discussion can be had on a case by case basis. The foster owner is not allowed to seek medical care at a facility other than Crossroads Animal Hospital unless prior arrangements and permission has been given by Dr Jordan. If a foster owner did seek medical care elsewhere without obtaining permission first, then there is no reimbursement for money spent on the foster horse’s medical care. CAH is on call at all times for emergency care so simply call us at 864-972- 9994 if there is a problem with a foster horse. If you cannot reach us at this number for some reason, you can contact one of the following board members and leave a message stating you have an emergency and need medical care for a foster pet: Anne Jordan 864-940-2273. 1) You will need to provide an appropriate sized pasture with safe fencing, 24/7 access to fresh water, and adequate grass and/or hay. We will visit your facility prior to fostering to determine if the situation is good for the particular horse needing fostering as different horses may require different sizes of pasture/amount of grass. 2) You will need to be willing to allow potential adoptive owners to visit the facility where the horse is to be kept and, if the horse is broken to ride, allow them to ride the horse. This will be done only after the potential adoptive owner has signed a liability agreement and only while they are supervised by CARE personnel. Someone from CARE will be present whenever potential adoptive owners are present and you will be informed prior to the visit so that you can give permission for a visit at that time. We will give you at least 24 hours notice. 3) You will need to be willing to have CARE and Crossroads Animal Hospital personnel visit where the horse is kept when needed for exams, vaccinations, and hoof care. Pete Ramey is our hoof trimmer and he will come every six weeks to provide hoof care. We will inform you of when we expect to visit to provide care for the horse(s). 4) You will need to check the horse(s) on at least a daily basis to ensure that they have fresh water, adequate grass or hay and that they appear healthy. You are responsible for contacting Crossroads Animal Hospital at 864-972-9994 immediately if any signs of injury or illness occur with the foster horse(s). This includes but is not limited to lameness, trouble breathing, nasal discharge, swollen eye or discharge from the eye, or any other concern. 5) You will need to provide halters, water buckets, and, if you want to ride the horse, appropriate tack. 6) You will need to keep stallions alone or with geldings (no mares or other stallions) and mares with other mares or geldings. Fencing must be adequate to prevent mares and stallions from getting together as we do not allow breeding of any of our foster horses (to each other or to foster owner’s horses. CARE typically requires that foster homes be within a 30 minute drive of Seneca, SC in order that timely veterinary care can be provided by Crossroads Animal Hospital in case of an emergency and in order that our farrier is able to travel to the location where the horses are. Exceptions may be possible for specific situations but would need to be approved by our board of directors. All adoption fees are set by CARE and all fees go into the adoption program. No money is paid to the foster family for keeping the horse(s). The adoption fees are non-negotiable. If the foster family wishes to adopt the horse they are fostering, they will need to pay the whole adoption fee, regardless of money they may have spent caring for the horse. If the foster family finds a potential home for a foster horse, the potential new owners should contact CARE and fill out an adoption application. 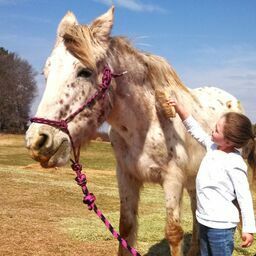 Only after they are approved and pay the adoption fee can the potential new owner adopt the horse. CARE is not responsible for any damage to items owned by the foster family. Please be aware that foster horses may not be trained in any way and may have been abused or neglected in the past. We often have no history on these horses other than their current appearance. The horse(s) may be prone to kicking, biting, or other dangerous behavior that we are not aware of. They may not know how to stand tied, pick up their feet, or other behaviors that a well trained horse will perform. Foster owners should take precautions while handling, tying, or otherwise interacting with foster horses. If damage does occur as a result of the behavior of a foster horse, CARE cannot provide any reimbursement. Riding: Most foster horses are not broken to ride, though some may be. If the horse is broken to ride and the foster owner(s) wish to ride the horse, they may. (dependent on Dr. Jordan’s ok that the horse is healthy enough for riding). If the foster owners wish to allow someone else to ride the horse, that may be possible once the additional person(s) is approved by CARE and has signed a liability agreement. By checking below you certify that you have read through this application and understand understand the requirements of adoption.